Ginger’s company, aptly called the Tomato Corporation, owns and works with a vast network of farms and food suppliers making quality, healthy food. Her trusty shovel hangs on the wall as a memento to her great work in past. During a trip back to her farm to visit to her grandparents, Ginger stumbles upon people making suspicious, and dangerous, experimental fruits and vegetables in her village. 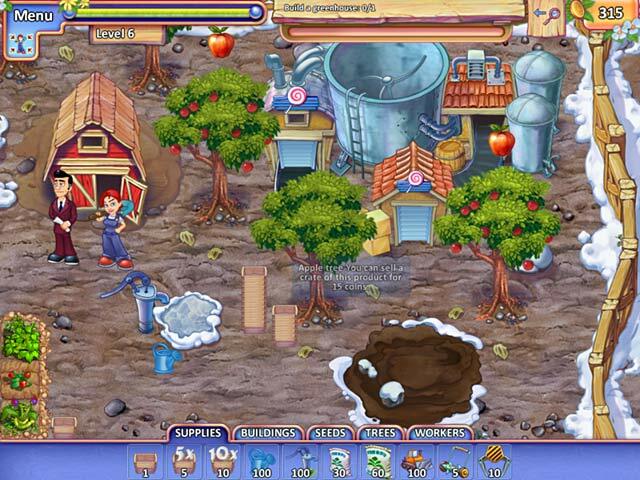 Dive into Farm Craft 2: Global Vegetable Crisis and save the world in this Time Management game. Stop the Global Veggie Crisis! 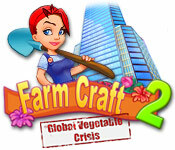 Farm Craft 2 is rated 4.4 out of 5 by 15. Rated 5 out of 5 by TimurSim from Lovest part! We want a continue of this game! We want a continue of this game! Rated 5 out of 5 by bradnmel69 from Excellent game really fun but I'm a little concerned because when I go to plant some onion bulbs, the next time I go in to the game they go out of place. one more thing is that I with they made it able to select difficulty. it is really easy . apart from that farm craft 2 is awesome!!!. Rated 5 out of 5 by barbara_g from More ipad games I would like to know when farm craft will be available for ipad? Rated 5 out of 5 by cake_zero from Farm Craft 2 I LOVE this game! The storyline is Excellent, The Quality is Excelent, and overall it's just FUN! I can't believe that 'Farm Frenzy' (The game I wouldn't recomend) is more popular than this game. Rated 5 out of 5 by Justy1002 from Super Fun! I must agree with the other reviews, this game delivers. I love that you're given a series of tasks, not all at the same time, but new tasks as you complete current ones. Makes the game interesting. I never felt rushed to beat a clock which is what I usually go for, so I think players who want a more relaxed play will love this too. The storyline gives a really good background to your purpose and it really was engaging. There's really nothing more than needs to be said that wasn't said before. I definitely recommend! Rated 5 out of 5 by SoCalMom from Fun Game I am a huge fan of Time Management games and both Farm Craft games delivered (in my opinion). I like having to perform multiple tasks to attain your goal in a limited amount of time. Not super hard and not so easy that it's not fun, it's just right. Had to replay a few levels just to get the expert goal time! I honestly don't pay much attention to story lines, I like getting right to the game so can't really comment on the story/plot. Rated 5 out of 5 by c_loo_less from Don't miss this gem! 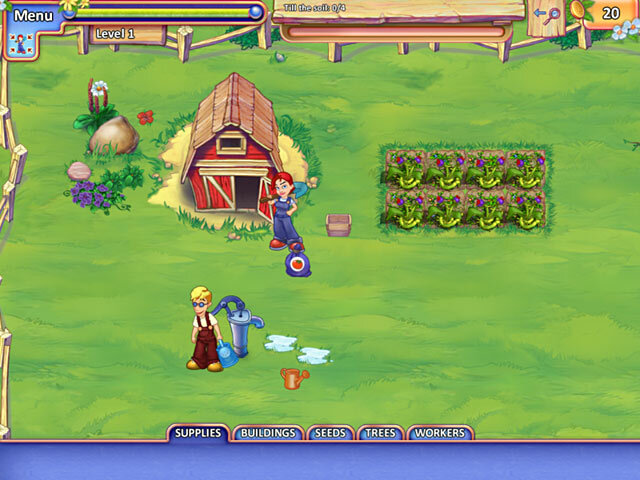 If you love farming time management games, do not miss trying this one, and also the prequel "Farm Craft". This is not just another farming scenario - there is so much more! 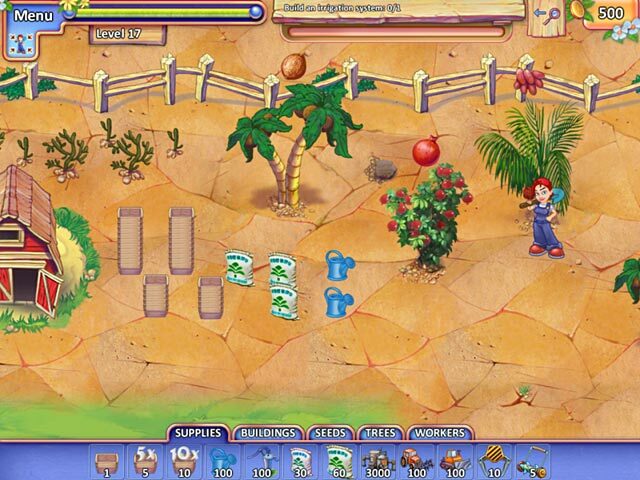 As you work your way through the levels, you will deal with such real-world issues as global warming (drought, floods, changing climates), economic crises, worker strikes, material shortages, and equipment breakdowns, all while using your strategy and problem solving skills to meet goals and produce your goods efficiently. While there is a time bar slowly counting down in each level - there is no ticking clock or urgent voice telling you to hurry, which I found very refreshing. You can complete the levels within the time given for trophies - or not. I found myself getting so engrossed in designing my farm for efficiency, solving problems, meeting goals and producing goods, that I just didn't care about the time bar. I still felt a sense of accomplishment for a job well done when each level was completed. The minigame levels in Farm Craft 2 are unique, very fun little adventures that all pertain to the main story line - my favorite is the Dream sequence; it made me laugh out loud. The story continues from the original Farm Craft, with much more detail and explanation of the main character Ginger's life and history. The engrossing story reads like a graphic novel, with mystery, intrigue, and interesting characters. Farm Craft 2 and the original Farm Craft are a great value for the money, as challenging as you want them to be, and I feel certain you will want to replay them again and again. They are so much fun! I have just one question for the design/development team: how long do I have to wait for Farm Craft 3? Rated 5 out of 5 by Phoenixice from Want more! I love this game so much, i have finished it and its original several times. i reset it every time just to do it over. Please, when will another Farm Craft be coming out? Rated 5 out of 5 by ashleyC27 from Even better than the first! I really enjoyed Farm Craft, so I was excited for FC2, & it did not disappoint! This game (along with the 1st) is without a doubt one of the best quality 'farm' games I have played. The game has many levels, which are longer & more challenging the further you progress. It has a good storyline that makes you interested in finding out what happens. It has excellent replay value & you can even go back and try to beat your best time on completed levels. Once you finish all the levels, 'Free Play' mode is unlocked, which gives you a large, wide space to develop your own farm however you want- with no time limits or objectives.... >>Bottom Line: Fun, challenging #but not too much so#, quality sound/graphics, ease of controls/navigation, interesting, and allows a certain freedom in planning/desgning that other farm games do not. Well worth the money! Rated 5 out of 5 by jjteach from Time management with a twist! I really liked the first version of this game - but I just love this second version and have been playing it for some time now. The levels last a long time with several tasks to complete on each level. Complete them within a certain time and you can earn trophies. This is pretty tricky and I am constantly playing the game, even though I have had it ages as I determined to get all the trophies (this is not easy) and I haven't done it yet. I really like the different strategies needed to play this game and it is never boring. The storyline is good fun and the different types of tasks needed also adds to the fun value. I have tried other farming games - but this is easily one of the best. Most of the others focus on gimicky farming stories. This is a good value, quality time management game for anyone who really likes a challenge. First class!!! Ginger must stop people making suspicious experimental fruits and vegetables, and stop the Global Vegetable Crisis!